Stop a goblin war so a family can return to their farm. Speak with the refugees at Crestbridge Camp to learn about a goblin war that has overrun their farm. Get the goblins to stop fighting. Let the refugees know that they can return and rebuild their farm. These are the minimum actions necessary to stop the fighting, but you can definitely be more extreme (i.e., kill all members of both goblin tribes and get both tribes' Totem Staffs) if you're feeling bloodthirsty. Mirisa suggests that you give the Totem Staff to another goblin tribe, and start a new goblin war. You can keep the Totem Staff: it is an enchanted staff that does 20 pts Shock Damage (3000 charge, 111 uses, 7760 gold). You can return the Totem Staff to the Bloody Hand Goblins (leave it outside Cracked Wood Cave). You can even keep the Totem Staff until the quest is officially completed, then return it to the Rock Biter Goblins and watch as the war starts back up again on top of the hapless farmers. As long as the Totem Staff is not in the Rock Biter Goblins' possession at the moment, the goblin war is over. The shaman is located in Cracked Wood Cave, which Mirisa will mark on your map. You need to make your way to the depths of the cave to find the shaman, getting past about ten other goblins of varying strength along the way. The shaman has spellcasting abilities and is likely to give you the hardest fight. With the shaman dead, the remaining Bloody Hand Goblins (if there are any!) will lose their desire to keep warring with the Rock Biter Goblins. More to the point, they will also stop bothering to attack you, allowing you to leave the cave. This can be particularly useful if you used Sneak to get in and failed to kill the shaman silently. (The goblins coming to help the shaman will lose interest). After halting the goblin war, return to Crestbridge Camp and talk to Barthel Gernand. He will thank you for your help. If you wait for Cropsford to be finished, you can go inside the larger of the two houses - the Bincals' House - and you will find a chest named "Reward Chest" on the second floor. This chest refills with gold once per week, and contains a leveled amount of gold (the amount will be ten times the character's level plus 0-19 additional gold). He also suggests that you return to Cropsford in a month for a "Hero's Welcome". 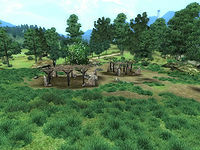 The farmers pack up their camp, return to Cropsford, and proceed to continue building their farm. You can visit them at various times and watch their progress. It is possible for one of the Bloody Hand Goblins raids to be a success, in which case the Bloody Hand Goblin War Chief will take their tribal staff back to his cave. However, this will only happen if the player character is nearby (the goblin war scripts only become fully active when the player is in the vicinity). If you keep the staff, the goblin war will be over. However, the Bloody Hand Goblins will still be looking for their staff and come after you (given you didn't kill their shaman or their war chief). Keep in mind that they can smell you and your staff from a long way away and are able to jump you anywhere, anytime... for as long as you possess the staff. These goblins have even been known to enter Oblivion gates in pursuit of their staff, so don't be surprised if you find them inside the Planes of Oblivion while you are carrying it. It is possible that after stealing the Totem Staff, Barthel Gernand won't recognize that the quest is done; the quest log does not update. One reported solution is to drop the Totem Staff and then pick it back up a short time later. Goblins in the Cracked Wood Cave have been found stuck in the wall, and could not be killed. However, it is not necessary to kill all the goblins to complete this quest. A campsite should appear at the fringe of Cropsford, which the family will use as a temporary house until buildings are constructed. Check back at Cropsford to observe the progress. Totem staves have been known to fall into the ground or have an appearance of 'floating' above the ground. Each time the section of the cave is loaded, the danger of one of these two glitches occurring increases. 10 I met Barthel Gernand on the road southeast of the Imperial City. He and his family wish to build a settlement at Cropsford, but have been unable to do so thanks to marauding goblins. I should talk to Mirisa about how to clear the goblins from the settlement site. Mirisa suggested two ways to deal with the goblins at Cropsford. One is to recover the Totem Head from the goblins in Timberscar Cave, which would stop the war between the two tribes and leave Cropsford in peace. The other way to keep the goblins away from Cropsford is to kill the shaman of the Cracked Wood Cave tribe, which should effectively destroy the tribe and stop their war parties from attacking Cropsford. 30 I have killed the shaman of the Cracked Wood Cave goblin tribe. I need to let Barthel Gernand know it's safe to begin building the settlement at Cropsford. 41 I need to bring the Totem Head to Mirisa, so she can be sure that the goblin threat to Cropsford is ended. 45 Mirisa said that I ended the war just by taking the head from Timberscar Cave. I should tell Barthel Gernand that it's safe for him and his family to return to Cropsford. 50 Barthel Gernand thanked me profusely for ending the goblin threat to Cropsford. He promised me a hero's welcome in Cropsford once they have had a chance to establish the settlement. It is possible to use the console to advance through the quest by entering setstage MS46 stage, where stage is the number of the stage you wish to complete. It is not possible to un-complete (i.e. go back) quest stages. See SetStage for more information.